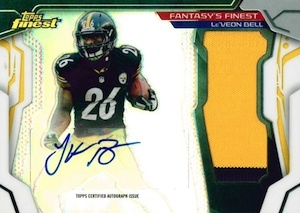 2014 Topps Finest Football sees the return of one of the hobby's longest running brands. Chromium card stock, rookie autographs and Refractors once again take center stage. Like recent years, 2014 Topps Finest Football boxes come in the form of two six-pack mini boxes. Each master box promises a Rookie Refractor Autograph Patch Card and an Autographed Jumbo Relic. The base set has 150 cards, 100 veterans and 50 rookies. Refractor parallels come in several levels. In addition to basic Refractors, there are X-Fractors, Blue (#/99), Gold (#/75), Red (#/50), Pulsar (#/25), BCA Pink (#/10), Salute to Service Camo (#/10), Printing Plates and Superfractors (1/1). Rookie Refractor Autograph Patch Cards come with a horizontal design. Cards have the same Refractor parallels as the base set. Those numbered to 25 and less come with jumbo swatches. These also have additional one-of-one parallels that come with some of the most recognizable parts of the jersey: Black Pigskin NFL Shield, Black NFLPA Logo, Black NFL Shield and Black Swoosh. The Autographed Jumbo Relic Refractors checklist has both rookies and veterans. The parallel levels and quantities are the same as the base cards. Everything numbered to 25 and less has a patch to replace the basic jersey relic. 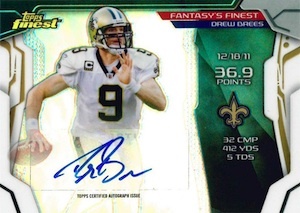 These aren't the only autographs in 2014 Topps Finest Football. Rookie Refractor Autograph Variations add a signature to the base design. Unlike last year, it appears as though these have sticker autographs. Base versions are numbered, as are the Refractor parallels: Blue (#/25), Red (#/15), Pulsar (#/5) and Superfractor (1/1). Mystery Rookie Autograph Redemptions won't be revealed until after the season starts. Dual Autograph Dual Relic (#/10) and Triple Autograph Triple Relic (#/10) cards come with signatures and memorabilia from multiple players. Quarterback Quartet Autograph Patch Book Cards (#/5) come with a Refractor design and signatures from four QBs. All three of these multi-player sets have one-of-one Superfractor parallels. 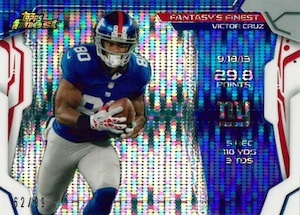 Collectors can find some basic inserts in 2014 Topps Finest Football as well. Fantasy's Finest look at top players from a fantasy football angle. Basic versions are one per mini box. Parallels include Refractors (1:5 mini boxes), Pulsar Refractor (#/99) and Superfractors (1/1). Select veterans and rookies have Fantasy Finest Autographed Jumbo Patch cards. There are also basic Autograph versions that have Pulsar (#/10) and Superfractor (1/1) parallels. Atomic Refractor Rookies also fall one per mini box. These have a die-cut design. Three levels of Refractor parallels are autographed: Red (#/25), Pulsar (#/10) and Superfractor (1/1). 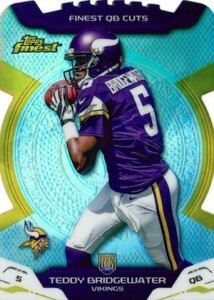 QB Cuts is a case-hit insert that also has a die-cut design. The checklist has both veteran and rookie quarterbacks. 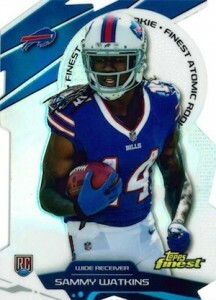 2014 Topps Finest Football Xfractor+Chrome Die Cut+BC+Mini Kelvin Benjamin LOT! 150 cards, including 50 rookies. Shop for base sets on eBay. Good: Clean design, Refractors are included in moderation, set size is not overwhelming, two autographed relics per master box. Bad: Sticker autographs, main rookie autograph relic cards are not numbered, base design might be too simple for Finest, inserts are a little stale. The Bottom Line: At this point, Finest is an institution for collectors, so you generally know what to expect. However, given a price point of around $80-90 a box for two hits that are likely to be non-numbered rookie sticker autographs and the odds seem greater to come away disappointed. 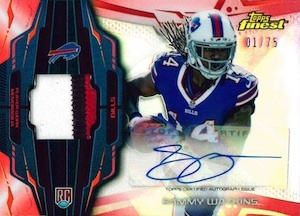 Topps goes simple with the 2014 Finest Football base design. Lots of gray and silver fill a background that is centered around a player image. Splashes of color on the sides and bottom text box keep it from becoming boring. Stat fanatics may not be as impressed with the card backs that only feature stats from 2013. However, a sizable blurb is included that covers the “2013 Finest Moment” for each player. Like all Finest products, colorful Refractors remain a prominent feature. 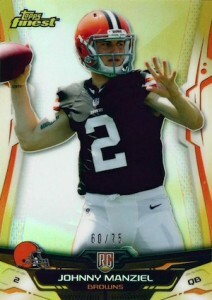 Although Topps could do a little more to evolve this concept, the color stands out in a great way. 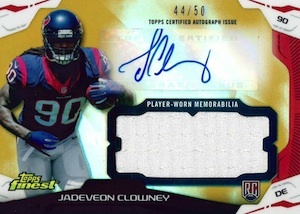 Sticker autographs are pretty disappointing for a product that is so geared toward rookie autographs. The autographed relics showcase a horizontal layout, which is a nice change from the base cards while still maintaing the feel of the product. The customary rookie die-cut insert returns with Atomic Refractor Rookies. There is nothing offensive about the design, but it is hardly remarkable and there always seems to be a quality issue with the cuts. The only other main card is the Fantasy’s Finest insets. The cards highlight a notable fantasy performance from the previous season for the player in question. The design doesn’t really convey the feel of an insert and resembles more of a horizontal base variation. With a 150-card base set, most of the top veteran names are included and the final 50 cards are reserved for rookies, which allows good coverage without going too deep into the draft. However, since each master box only contains 60 cards, the base set will take at least three boxes to complete with perfect collation. Although geared heavily to the 2014 rookie class, there are some top veteran autograph available in the Fantasy’s Finest inserts, but they also feature sticker autographs. Finest is normally a good option for collectors who want some base and inserts, but don’t want to be buried in them. This continues in 2014. As previously stated, value is tough for boxes that yield mostly non-numbered sticker autographs. The rookie hype for 2014 has not been fully met, but nearly all of the big names are present in the product and there is still plenty of football to be played. Unfortunately, even if one or several payers from the class become stars, 2014 Finest won’t be as appealing because stickers are not the preferred route for the majority of collectors. Finest is a fun product. Shiny cards, colorful Refractors and guaranteed autographs normally make for an exciting break. There is a reason why the brand has thrived for so long. For many collectors, it marks an appealing configuration that walks the line between a product that has a surplus of cards and a product with a one-pack format. Finest also seems to be one of the only lines to resist the lure of the SPs/variations that have seemingly inundated the hobby. This is quite refreshing. 2014 Topps Finest Jimmy Garoppolo Rookie Refractor #116 (Patriots) Look!! Hot!!! 2014 Topps Finest SP XFRACTOR PEYTON MANNING SILVER HOLO REFRACTOR Broncos! seems to go out with a fizzle…no on-card autos? Pulled a redemption uncut sheet?!? Any idea on the odds and value of this??? Any advice appreciated. Thanks!!! Very poor circulation. 1 case gave me 4 Ka’deem Carey jersey auto’s 3 Jordan Matthews jersey auto’s and 2 Marquee Lee jersey auto’s. All sticker autos….bum. Participated in some case breaks, double and even triples up the kazoo. Maybe ok for a box. But, don’t do a case. Anything Topps can do to cut some corners and send more money to the guy or guys at the top, they will do it!!!! 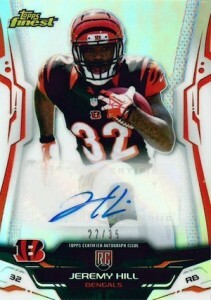 Topps FINEST Sticker auto product! Anth they collate this particular product like a group of monkeys in a zoo, u are liable to get the same couple player auto’s 4-8 times in a case. Tony hill � At this point the football exclusive is between Panini and the NFLPA, not the NFL. Also, it doesn’t kick in until 2016 so there’s another season of Topps cards after this if the NFL does go exclusive or Topps opts to stop making football products. I think I did incredibly well in a box break. Ended up hitting a Bortles pulsar auto /5. I bought a box and never got a Autographed Refractor Jumbo Relic. I had two Rookie Refractor Autograph Patch Card. Would have been nice to get what is promised! to many repeat hits per case, tom savage,aaron murray, and jace amaro, wheres the variation? this isnt ideal for breaking, terrible effort from topps once again. Eric, so I’m assuming your one of the two bortles on eBay? Asking $1600 for a graded one or taking down an auction to relist and ask more because you were getting offers for $500? Robert, depends what your breaking for! Money, fun, money? Going to assume money…as most people buy boxes for fun! I think anyone that’s been opening packs for 20 years knows anyone should temper their expectations. But when most are just buying cases to sell the stuff of course your going to be upset with getting doubles or triples. Maybe don’t have expectations and you won’t be disappointed for getting nothing(in your opinions)! You will get your inserts and parallels no problem. Plenty of those in every box. Even though the year is knew it seems as though this product came just in time to give me HIT fatigue from seeing the same people over and over. There are great HITS out there but seems like about 1 in every 4 boxes will have a premium HIT. any word on who the mystery rookie auto redemption is? I was very pleased with my two boxes. Pulled a Derek Carr jersey auto /99. A Logan Thomas NFL shield logo black refractor 1/1. And my second box I pulled a Johnny manziel pink 2 color jumbo #2/10. I am not hatin whatsoever. I don’t get it.. Does Topps have a bias to baseball over football? 2014 Finest Baseball were beautiful! So naturally I was excited for Finest this year. Needless to say, I like everyone else was disappointed with the product. As mentioned in my review for Platinum, it seems like their football lines have an identity crisis. Platinum feels and looks like finest and finest looks like a lackluster and lack of love product. Awesome cards! I pulled some really sweet cards!! love the brand always have. just not so happy with the pricing/valuing going out to some of the named rc’s in this set for their auto patch refractor type cards, bv set by beckett seems insanely low for D.Carr in Finest and Platinum. I know it took beckett like til 3 issues ago to move D.Carr’s five star rc auto from 75 to 150 in 1 issue. As collectors would u value buying rc auto’s of Derek Carr or ODB jr. if looking for the biggest long term HIT/potential growth from 2014. No clue why Carr’s stuff isn’t equal to ODB jr. by now, with position he plays, and how great he has gotten, and his squad is loaded on offense. Am I crazy or do u always go with the QB???? 2014 Topps Finest Football Hobby Box - Factory Sealed!